Lucy Harker is the daughter of Count Dracula and Mina Harker, a fact known only to a handful of people. Growing up half-vampire, she is trained to become a spy for the British government and is directed by the mysterious M, in this case that stands for Mycroft Holmes. In her first field assignment, Lucy is told to she is to act as a secret bodyguard to an American military officer traveling back the United States aboard the maiden ship Titantic. The officer carries with him the plans to Captain Nemo’s long lost super submarine, the Nautilus. It is imperative the plans reach America safely and do not fall into enemy hands. The enemy being the Germans who are once again beating the drums of war. Now if you love outlandish pulp plots as this reviewer does, then you have to know Ms. Ward’s is so marvelously peppered with such well known fictional characters that we were captivated from the very first chapter. 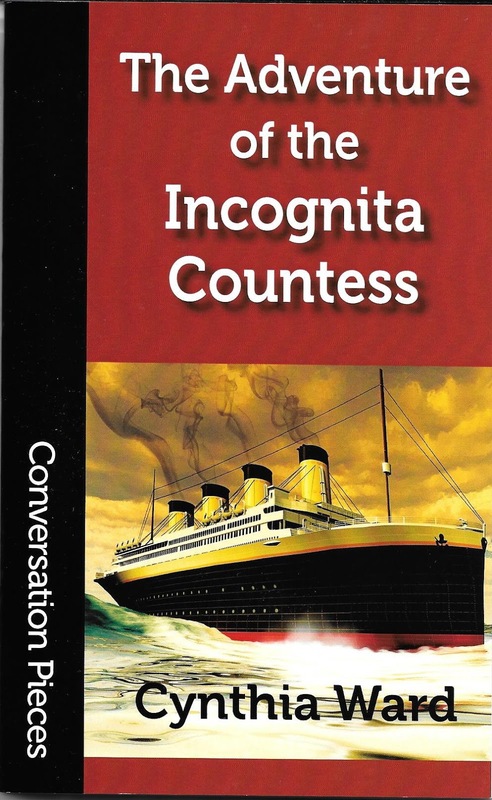 Never mind that once aboard the Titantic, Lucy encounters the Lord and Lady Greyborough; well known throughout the empire for their wealth and prestige. Rumors abound that he, James Greyborough, was actually raised by apes in the jungles of Africa as a babe. Lucy sees him as a possible ally should she need one during the long sea trip. Whereas there are several German agents also on board; which comes as no real surprise. Having been properly briefed my M, Lucy believes herself ready for anything. Anything that is except for a beautiful young woman named Carmilla Karnstein who happens to be an actual vampire with abilities far beyond her own. Though instantly attracted to the exotic beauty, Lucy suspects her of being in with the spies and must be ever vigilant or else be undone. But when her passions threaten to override her training, she soon finds herself in more danger than she could possibly have imagined. 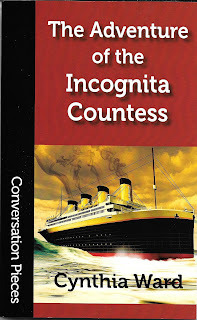 “The Adventure of the Incognita Countess,” is pure pulp in the grandest style and Ward’s panache in bringing these colorful characters together in such a radical, over-the-top plot is just fantastic. This is one of those adventures one needs to relish and relinquish all attempts finding a rational behind the plot. It’s just fun…and tons of it. And wait till the iceberg shows up! Once again the good folks at Flinch Books have put together another terrific anthology filled with top-notch stories. 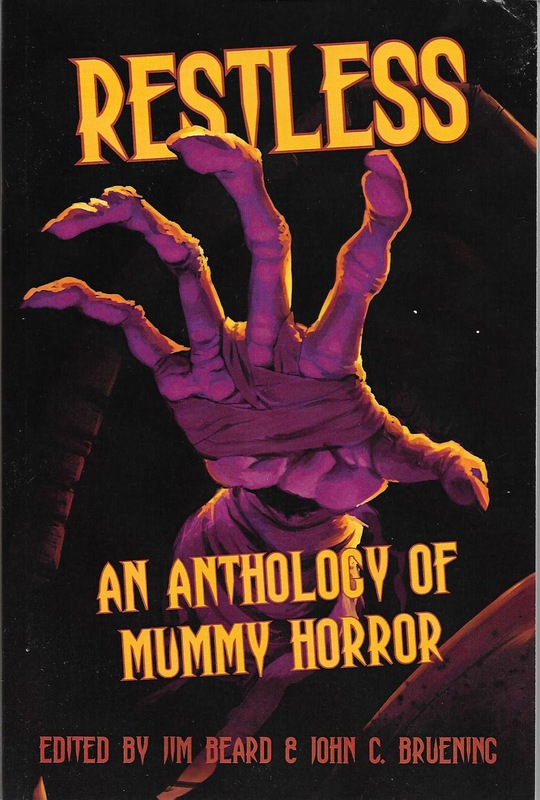 This one’s theme all about the classic Mummy monsters found in black and white movies and turn of the century horror novels. The writers are among the best of New Pulp today and they do not disappoint even the most jaded of readers. Barry Reese kicks it all off with his “Love’s Deadly Kiss.” When a British explorer Thomas York returns to England after his latest adventures in Africa, he discovers that his old friend has acquired a unique mummy and appears to be under its influence somehow. When that gentleman is cruelly murdered, York investigates only to learn he too has fallen victim to the sway of this ancient, immortal temptress. “To Rise and Conquer” by Teel James Glenn follows next. During the Japanese invasion of China, an America flier finds himself fleeing with several escapees through the rugged terrain of Mongolia. They find a hidden cave in which to hide from their pursuers only to discover it holds the remains one of history’s most lauded conquerors. “The Weighing of the Dead,” is by Sam Gafford and introduces us to a British occult detective named Dr. Greenwood and his first meeting with Claire Montgomery, an archeologist looking into mysterious occurrences in the London Royal Museum. Plenty of horror and action ensue. Duane Spurlock then offers up “Spirits From the Dread World.” An ancient Aztec mummy is revised to wreak havoc on the citizens of Mexico City unless a once famous luchador named El Puno can regain his courage and come to their rescue. “The Warrior and the Stone,” by John Bruening has archeologist Jake Bennett and his Turkish guide, Haluk deep in the mountains between Tibet and China looking of a lost magical stone said to bestow immortality. Instead what they uncover is an ancient warrior trapped in time and awaiting his last battle. Nancy Hansen wraps up the volume with her story, “Sacrifices.” When the mummified remains of a warrior women are found intact in the wilderness of the Russian steppes, Marcela Ramos is called in by a Russian colleague to help investigate. But no sooner does she set about bringing the frozen corpse back to the United States when a serious of mysterious accidents befalls the crews involved with the transport process. Enough so that Marcela soon realizes she’s taken on a horrible curse that could spell her doom. It isn’t often when reviewing an anthology that we have such a difficult time choosing our favorite entry. That’s how great all these stories in this collection truly are. Whereas if given no other recourse, our needle with point to Teel James Glenn by the narrowest of margins. Truthfully, this there isn’t a bad apple in the bunch and our fedora if off to Flinch Books once again. 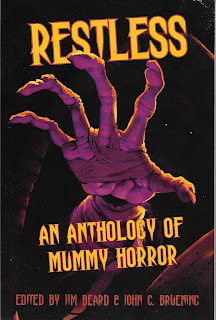 If you love old fashion horror, pick up “Restless,” dim the lights and sit down for an evening reading pleasure. You can thank us later. 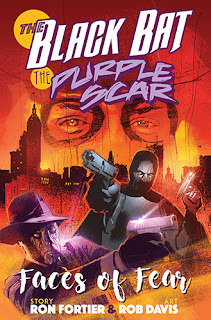 Just finished the novella, THE BLACK BAT/THE PURPLE SCAR: FACES OF FEAR, the latest crossover adventure from Moonstone Books. Gotta say--whoa!!! This one sure overflows with action and intrigue. It's also written by Black Bat raconteur and Airship 27 Publications founder, Ron Fortier (a good sign, if ever there was one, for no one weaves a New Pulp yarn quite like Captain Ron). The adventure is also graced by gripping illustrations from his creative pal, the legendary Rob Davis!!! Faces of Fear deals with the evident rise of dead criminals within Black Bat/Tony Quinn's NY turf. It appears that the insidious, porcelain-faced Mr. Mask is responsible. Naturally, Black Bat (accompanied by his faithful assistant, Silk Kirby) leaps in to tackle the situation. However, as the weirdness mounts, another enigmatic figure enters--that hard-hitting, rubber-masked avenger, the Purple Scar, aka Miles Murdoch. After the Black Bat rescues the Purple Scar from a sticky situation, the crusaders decide to join forces to untangle the perplexing manifestations. As with Fortier's Black Bat comic-book entries, Faces of Fear moves at a rapid clip, but the blistering action never blurs the characterizations, which remain distinct throughout, courtesy of the author's crisp, engaging style. The story also does an excellent job probing concepts of identity and the secrets people tuck beneath their various facades. Davis' wonderful illustrations give a film-noir ambiance to the tale: each image projecting a moody, almost three-dimensional depth that pulp fans will relish. By the adventure's conclusion, one side triumphs over the other, but I won't reveal exactly how. Experiencing the way Black Bat and Purple Scar (or more precisely, Fortier and Davis) make it click is all part of the fun. Incidentally, the stunning hardback-cover artwork is by Davis, with Eric Enervold having rendered the dynamic, softcover version. Cool!!! Give Faces of Fear a try. You're guaranteed a rousing treat, with either edition you buy. Heck, why not splurge for both? We love this book! The reasons for this overwhelming reaction are many and we’ll happily elaborate for your edification. Years ago, while still in high school, we discovered the works of British writer C.S. Forster and his clever navel hero, Horatio Hornblower. It was a romantic saga filled with action and heroes; the stuff teenage boys dream of. Then along about that same period in our creative evolution, we discovered the grand airships of old, from the German made Zeppelins to their American Navy counterparts, the Los Angeles and Macon. We began promptly collecting everything we could in regards to these fantastic clippers of the cloud. Thus is should be no surprise to anyone that when we began our own publishing venture, we labeled it Airship 27 Productions. 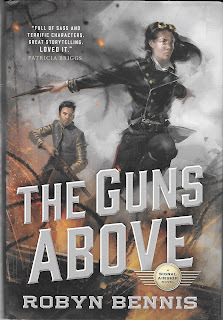 Now, we report all of this because in lieu of the ever increasing popularity of steampunk, more and more books have been written dealing with airships; including “The Guns of Above.” When we saw an ad on-line for the title, we immediately reached out to Tor Books and asked to receive a review copy. They were gracious enough to respond and last week it arrived, wrapped in a truly beautiful cover by artist Tommy Arnold. Lt. Josette Dupre is an executive officer on a Garnian Army’s Aerial Signal Corp airship during the bloody war with their enemy, the neighboring nation of Vinzhalia. As the book opens, her ship, the Osprey has crash landed in the middle of a savage battle and her captain killed. Dupre takes command of the survivors and rallies the ground forces to salvage a victory from sure defeat. As a reward for her gallantry, she is promoted to Captain and given her own ship, a small scout christened the Mistral. Now in the grand tradition of steampunk, we must explain these are not the more recognizable airships of our own reality, but actual steam powered rigid crafts containing multiple gas bags and armed with canons locked into wheeled tracks. The airmen fire powder and flint rifles. Considering this level of technology, it becomes all too clear within the first few chapters that life aboard these airships are fraught with peril, if not from enemy airships, then the very fragility of the ships themselves. And it is in this world where life and death waltz together in the heavens that Captain Josette Dupre finds her calling. Whereas the mores of the time are not as advanced as the sciences and though women are allowed to serve in the aircorp, they are forbidden to participate in actual combat. Dupre’s promotion has nothing to do with her skills or heroism, but rather the fact that the war has decimated the ranks of qualified officers and that is why she is given Mistral; there was no else available. A fact she is all too aware of. But it doesn’t deter her from recruiting other women for her own crew and treating them as equals. She even has a spy to contend with. The Commander of the Garnian Army, one General Hinkal, wants to see her fail and so orders his aristocratic nephew, Lord Bernat Hinkal to fly with the Mistral and there write up a secret report detailing Dupre’s failings so as to provide the General with the evidence he requires to have her dismissed and removed from command. All of which would be easy enough to accomplish if not for two things. The first being Josette Dupre is very much a capable leader and skillfully leads her new ship into one hazardous mission after another gradually inspiring her crew and gaining their loyalty. While at the same time winning over Bernat, a spoiled dandy who, for the first time in his life, is given the opportunity to act like a man, to find his own self worth and in the process become Dupre’s most unlikely ally. 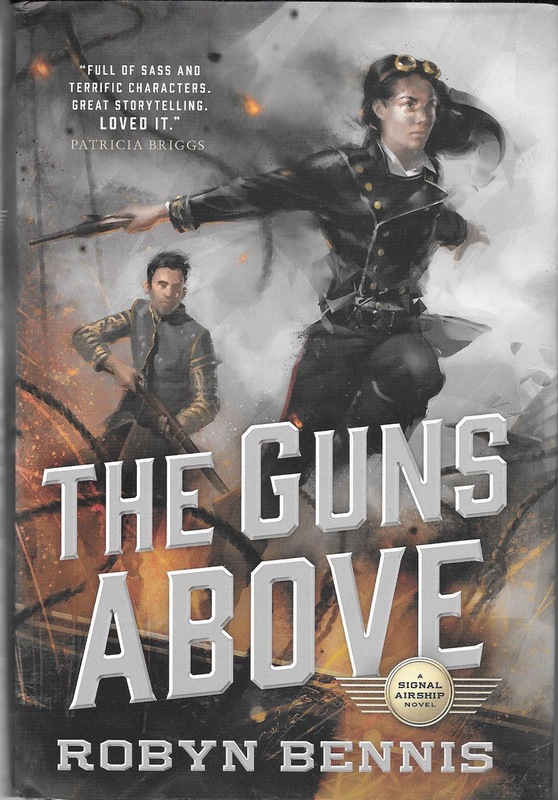 “The Guns Above” is a rousing adventure from first page to last and what is even more unbelievable is the fact that it is the author’s debut novel. It has been a long time since this reviewer has been so enamored with a fictional character so brilliantly conceived and realized. Captain Josette Dupre is such a figure and when you’ve read her adventures, you’ll add her to the ranks of such heroes as Hornblower and James T. Kirk. When Jan. 2018 rolls around, we will be nominating “The Guns Above” for the Pulp Factory Awards in the Best Novel category. Now go grab a copy and join us.